I met recently with the head coach of the Central Catholic girls varsity basketball program Casey Grange. Coach Grange talked to me about the intricacies of their read and react motion offense and why it works for their team. She also shared one simple drill that makes a big difference in the success of this offense. Last season Coach Grange introduced a read and react offense for the first time at Central Catholic. The basic principle is that when a pass is made, the player that made the pass must either front cut or back cut. Assuming that player is not open, she has three options. She can move to an open spot on the perimeter, post-up, or set a back screen for a teammate. The optimal decision depends on the defense and the individual player’s skill set. As the players get used to that layer of the offense, Coach Grange gradually introduced more complex ideas. Another principle Central Catholic follows is a cue on when to back cut. If a team is up the line denying the pass to the perimeter, Central Catholic players will cut backdoor. Again that player making the cut will have three options if the pass is not there. 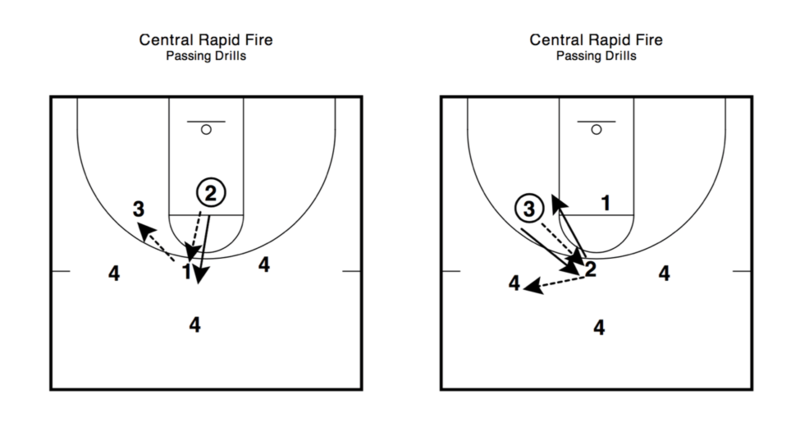 A third principle of the read and react is that Central Catholic can set a screen away from the ball on the outside defender for any team that is showing significant help toward the ball. Screening the outside gives assurance that a skip pass will arrive to its target and make a close out one step slower. 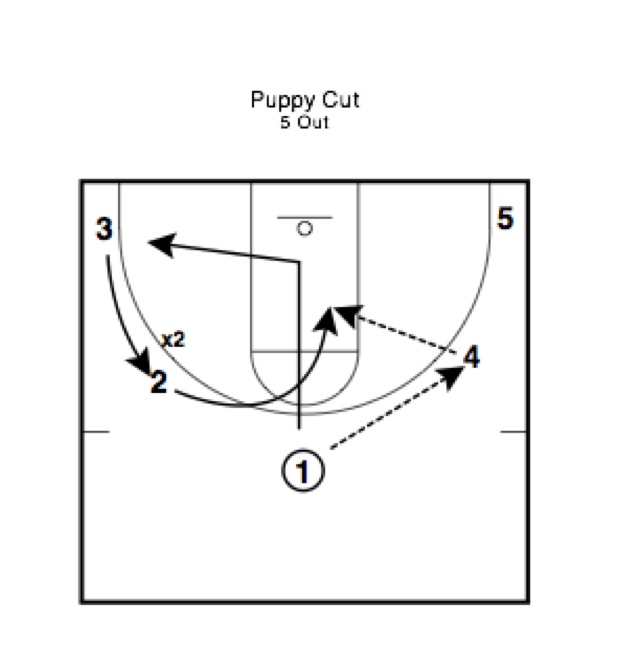 Finally, Coach Grange also told me that as a person is filling a space that used to be occupied they can do what they call a “puppy cut.” This sounds funny, but it is the actual terminology that Rick Torbett uses in this video. Coach Grange relied on Torbett’s videos to help familiarize herself with how to teach her team. Coach Grange appears convinced that last season’s “subscription” to this offense will be renewed. When I asked her why she liked this offense, it was hard to argue with the points she made. The primary benefit Coach Grange cited is that unlike set plays, the defense cannot cheat. Bob Hurley Sr. and Bobby Knight were always advocates for working on two hours of offense and two hours of defense during a two-hour practice. After the initial nuts and bolts are in place, the read and react, and whatever type of defense the team employs can be put in place. Defenses get in better habits since they do not know what the offense might try. Players must learn to contain the offense rather than gamble and go for hero plays. With sets every part of the offense has to be compartmentalized. And if one player gets thrown into a position they are unfamiliar with the whole offense suffers. To a degree, the read and react offense does need to be broken down piece by piece as well. Coach Grange told me that the team has to grow in how they set back screens out of it. That said, once it is broken down piece by piece the offensive players are not robotic. They exploit defensive mistakes, which forces defenses to think and work harder than they would against a play they have memorized. I asked Coach Grange for one thing that they do at Central Catholic that would help any program. She gave me a very basic drill that focuses on passing. Of course the read and react has many layers to it, but at the most basic level the players must be able to throw and receive a pass. As my high school coach reminded me, catching a pass with two hands is undervalued and ignored in teaching the game. Many turnovers occur because of this very basic skill – or lack thereof. Within this drill, Coach Grange throws little wrinkles. She will ask players to fake first. There also might be a sudden change of direction to create chaos. Most important from my perspective with this is that players learn to make crisp passes. Coach Grange called them zip passes. Too many players get conditioned to throw soft high arching passes. Around the perimeter especially, these passes will result in turnovers.